Excitement and anticipation build as the Fall wedding season approaches! Did you know that nationally 40% of all weddings happen in the months of September, October and November! At Pepper Sprout Barn, 53% of our weddings take place in the three month period known as Autumn! Fall is a favorite for so many reasons. Crisp air, cool nights, colorful leaves and all things pumpkin, not to mention it’s boot and sweater season! For weddings, we love the mix of deep rich hues, neutrals and greenery that are on trend. There truly is a plethora of color options for Fall—soft and neutral, bold and bright or deep and rich—any color works, just choose your favorites. Another reason everyone loves fall weddings…the details! There is no end to the options. Cool air brings an excuse for s’mores and hot cocoa bars, we embrace the season with pumpkins, pinecones, leaves and wreaths and we accessorize with blankets, scarves and layers. Each and every fall detail can be incorporated into your wedding day. We’ve included a gallery below of some of our favorite fall wedding details. Quilts to keep your guests warm, s’mores to eat and show off your ring and pumpkins and mums for the ceremony area. Quintessential fall! Bring on the layers, it’s fall y’all! You can also incorporate fall details into your decor and bridal fashion. Layers are a great option for fall brides and bridesmaids. Layers are often a necessity—shawls, capes, denim jackets, flannel or pashminas are ideal to keep you warm during pictures, if you are enjoying cocktails outside or just to transition from one area to another. Layers make great detail shots, add variety into your wedding wardrobe and give your photographer way to style your wedding photos in different ways. Each layered piece doesn’t need to be worn throughout your day but it’s fun to have options…like your everyday wardrobe, just elevated, since it is your wedding day. Check out some of our favorite ways our Fall brides have styled their look. Don’t wait to book your preferred date! If you dream of a Fall wedding, you need to plan ahead. Fall weddings book out on average 15 months in advance. If you are a last-minute personality (3-6 months out), luck will need to be on your side because it’s harder to find a fall Saturday date unless there is a cancellation. If you are open to a Friday or Sunday date, you may still have a chance. Keep in mind, you can find your venue, set your date and take a bit of time to breathe. Just don’t take too long because other vendors book out fast too—many can only do one wedding a day, just like most venues. Our advice, pick your photographer next then your DJ. The fun details like colors, decor and styles can be decided after your main vendors are booked. Trust us, you’ll feel better knowing they are locked in. Check out our blog post about wedding dresses to learn our tips about shopping for your season and venue. Weather can be a bit unpredictable. Fall in Georgia is a defined season, which we love, what we don’t love is what a slow start it can have. When September hits, PSLs are released, candy corn adorns the grocery aisles and we are anxious to wear our boots but Mother Nature says “not so fast!”. September in Georgia is still warm (ok, hot! ), we start off in the 90s and if we are lucky, can drop to mid-80s by the end of September. In 2016, our wedding on Sept. 24th was 98 degrees but then we’ve had one on Sept. 16, 2017 that was a perfect 82. Our suggestion, watch the forecast and keep your guests in mind. In September, you may need to provide hand fans or waters for your outside ceremony and be flexible. If it’s 92 and you’re are serving shrimp shooters for apps at your outdoor cocktail hour, it may have to be moved indoors. You don’t want sick guests or a million flies! Come October in Georgia, we finally start to get a break from the heat but we can still get pop up storms and windy days. Our advice is always be sure your venue has a rain plan and be patient with outdoor decor if it’s a windy day. It’s always helpful to bring tools and tricks to keep things sturdy. Zip ties, stakes, heavy stones to weigh things down. They all come in handy if the winds are gusty. Think about hair styles for windy days too. Up-dos can be great for fall weddings. You don’t want hair all over the place for your pictures! Veils floating in the air can be pretty, your curls going straight up…not as much! 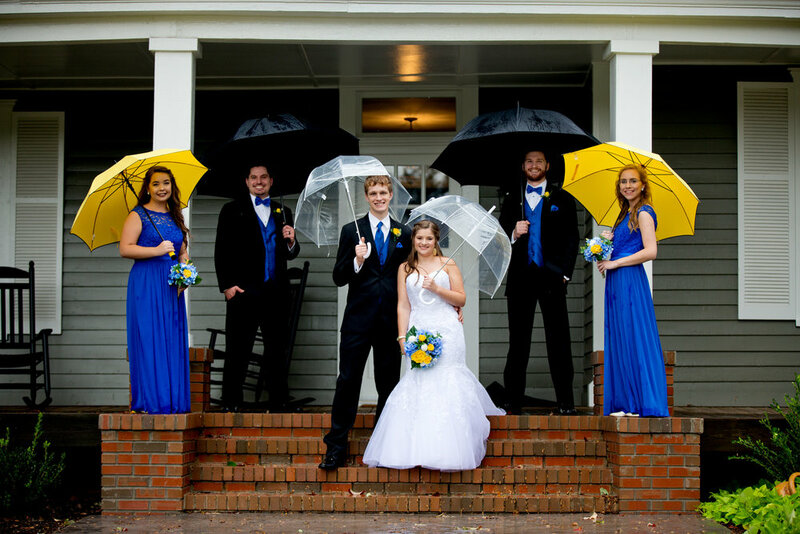 Rain on this October day didn’t get this couple down! Pops of color helped. Photo by Taken by Tate. As the end of Fall approaches, Georgia’s change of temperatures can be drastic in just a matter of hours. Be sure to prepare for change…sunny skies can turn to cold nights, cool days can turn to rainy nights. It brings us back to the suggestions of layers, flexible attitudes and being prepared. Quilts or hot hands might be needed if you go outdoors to say “I do” and be sure to warn your guests that you have plans for an outdoor ceremony, they can plan ahead and bring a jacket or wear pants. Guests appreciate being “in the know” and having a chance to prepare accordingly. It allows them to enjoy the moment without shivering. The wind on this day helped create a beautiful shot. Picture by Taken by Tate. Last reminder for Fall Weddings…the time change. Come the first weekend in November, we fall back an hour and that can directly affect the time of an outdoor ceremony. When planning for your wedding day, keep the clock in mind. Your time of ceremony directly correlates with your day-of timeline. We often recommend our couples consider a first look. Doing a first look, will ensure you have time to get all your pictures in before the sun sets. If you want to remain traditional and not see each other until the walk down the aisle, plan your ceremony early, you’ll want at least ninety minutes of sunlight before the sunset time. You might not need it all but there can be delays and in the end, the pictures are all you’ll have of your wedding ten years from now so you want to be sure to get through your shot list and that they have the light and look you’ve dreamed about. As you plan your perfect Fall wedding, there is a lot to keep in mind but there is so much about this favorite season that can add character, dimension and special touches to your day. As we always say at Pepper Sprout Barn, pick the elements of the season that speak to you so that your day reflects the love and personality of you as a couple. The attention to detail and the unique touches you incorporate into your plans will have your guests talking about your wedding day for years to come. Tell us your favorite thing about Fall, we’d love to hear in the comments below!